With only a few days left to wait, a Redditor (who presumably has a death wish) has revealed a new look at twenty seconds of Red Dead Redemption 2 gameplay in an early leak. While it’s really just a brief glance, it does give us a good a look at what we can expect from the game in an unscripted way. Arthur rides up on a group of men, dismounts, and then dispatches of them pretty convincingly with the last enemy to die biting the bullet in slow motion. Shame they haven’t gone the full hog with the Sniper Elite thing, mind. 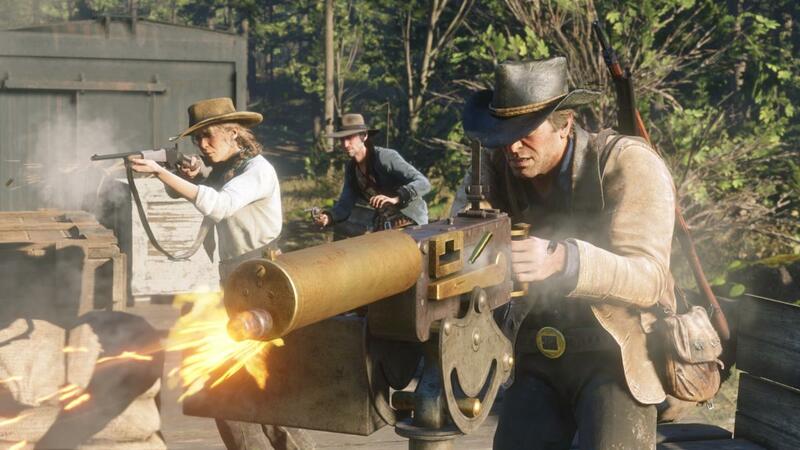 If you’re interested in the smaller details, there looks to be an option to have different weapons on your horse and a slightly revamped weapon wheel. The wanted system returns and shows exactly what the player has done wrong, as well as the fact that nobody will ever get horse AI completely right. Red Dead Redemption 2 launches on PS4 and Xbox One on October 26th. We out here celebrating video games. Come join us. Just started in Rockstar's newest timesink? Check out our Red Dead Online tips for making money, fast travel, being honorable, and more.